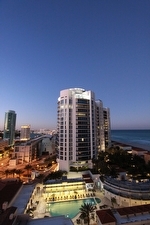 The classic twenty story Bath Club is found on Miami Beach's Collins Avenue directly overlooking the beach. 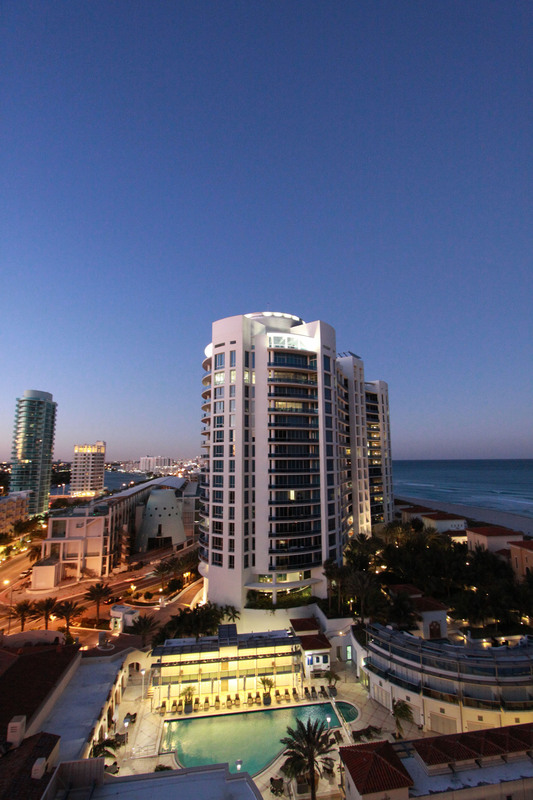 Despite its decades of existence, the building received a huge renovation in 2005 and it remains one of the top Miami Beach condos for sale. To this day the Bath Club features amenities that you may have a hard time finding in any other condominium. Within the three story lobby of Bath Club you'll find a gourmet market and newsstand and elsewhere you'll come across a pair of clay tennis courts, a health spa, business center, a lap pool along with poolside cabanas and various services such as housekeeping. There are 112 tower residences available in eight floorplans and a sextet of villas within Bath Club condo with one to five bedrooms depending on the residence. Features include ten or twelve foot ceilings, glass railed terraces, European cabinetry and floor to ceiling windows to name a few. Hang out at the Bath Club spa or explore beyond the building and visit what's in and around Miami Beach like popular Ocean Drive, the shopping and dining of Lincoln Road or the sun-kissed beach itself. 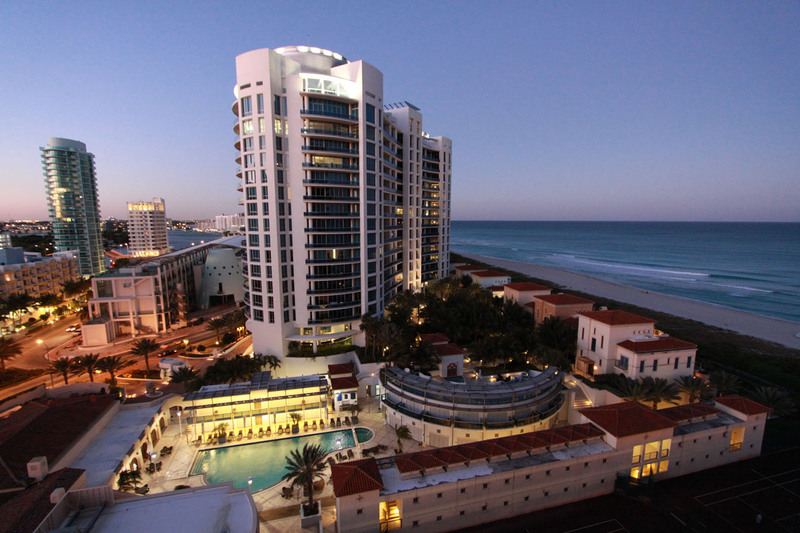 The South Beach area is home to Smith & Wollensky, another popular hangout. The Bath Club Original Miami Beach Getaway In the 1920's, the Bath Club was the original Miami Beach getaway for the rich and famous around the US. After a multimillion-dollar renovation project, this posh property is reclaiming its throne as the best place to stay in Miami Beach. The Bath Club offers ultra-exclusive, ultra-luxury residences and benefits. The Bath Club provides an amazingly diverse list of amenities and benefits for owners and guests, including options that cannot be found anywhere else in the city. The semi-private beach is a fantastic amenity, beloved by many. However, the pool and Jacuzzi area is stunning. The spacious sundeck gives you the perfect place to enjoy the Miami sunshine, while relaxing in solitude and peace. Poolside cabanas offer you incredible benefits, including discreet privacy and air conditioning. Recline on the European lounges and sip a custom drink during your stay. The full service spa on property features all the best services and treatments. Hot stone therapy, full body massage and many other therapeutic offerings make this the single best place to unwind during your stay. If you prefer something a little steamier, visit the sauna and steam rooms for a warm, relaxing steam soak. The state of the art gym provides you with access to incredible fitness equipment, as well as the space you need for any type of workout. Clay tennis courts have been added during the renovation to provide you with the best playing surface available. Dine with Katrina's Restaurant for the best in fine dining. Each handcrafted dish is a masterpiece, worthy of critical acclaim. Serving organic vegetables, fresh fish and the best of organic meats, you'll not find a better dining option anywhere else in Miami Beach. If you would prefer, you can enjoy poolside service for drinks and meals, romantic meal options and much, much more. The wine cellar on property is fully stocked with the best rare vintages to satisfy your palate, while holiday meals and 5-star catering are also available for your events. The villas at Bath Club are spectacularly elegant. Each offers stunning beauty, combined with elegance not found elsewhere in the city. The master suite features frescos on the ceiling, while the entire villa enjoys marble floors and walls. The very best of fine furnishings have been provided for your comfort and enjoyment, as well. If you desire ultra-luxury residences and the very best that the world has to offer, the Bath Club is for you.